Greetings From Witness Protection by Jake Burt, is by far one of the best books I have read in awhile. Niki Demere, an orphan pickpocket from NY.C, feels that there is no chance of ever getting adopted, but an opportunity of a lifetime is given to her. A family needs her help to remain safe from a huge mob family known as the Cercatores. Niki soon becomes known as Charlotte Ashlynn Trevor. The family now known as the Trevors move to Georgia. In their new home they are faced with tough challenges like making new friends, dealing with the fact that a mob family is on the verge of finding them, and their biggest challenge: not sticking out. As Niki, or Charlotte, gets to know the family, they reveal a secret to her. The Trevors where originally part of the Cercatore family. Her new mother Elena, or Harriet, “snitched” on her own family. The new family all knew that in a mob family, you never “snitch” on your own blood. Niki was added to the family because the Cercatores knew that there was only one child in the family. Adding another would help hide their tracks. 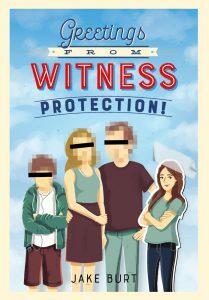 I have never read a book that has this exciting and new idea of an inside look at what being a foster in a new family in witness protection is like. I would definitely recommend this book to anyone who loves an suspenseful book that at the same time shows some very relatable moments of a teenage girl entering a new school. ~Savanna G.